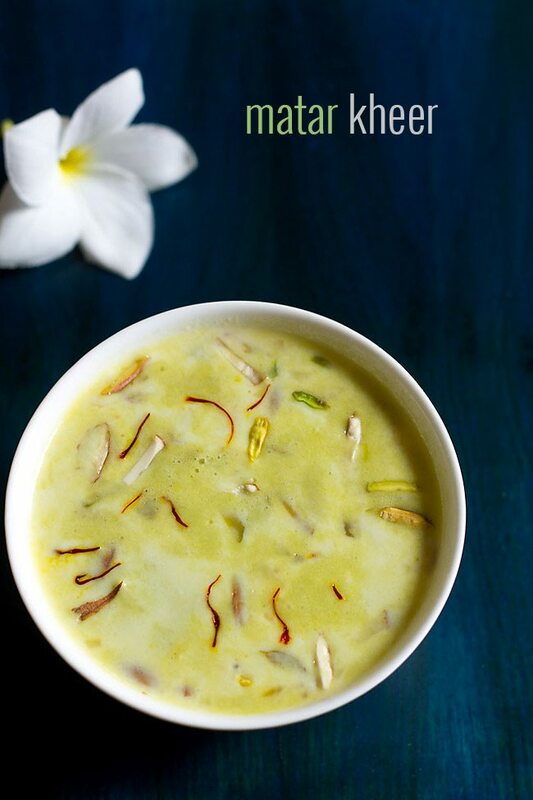 badam kheer or almond payasam is a delicious creamy kheer made with blanched almond paste, milk and saffron. 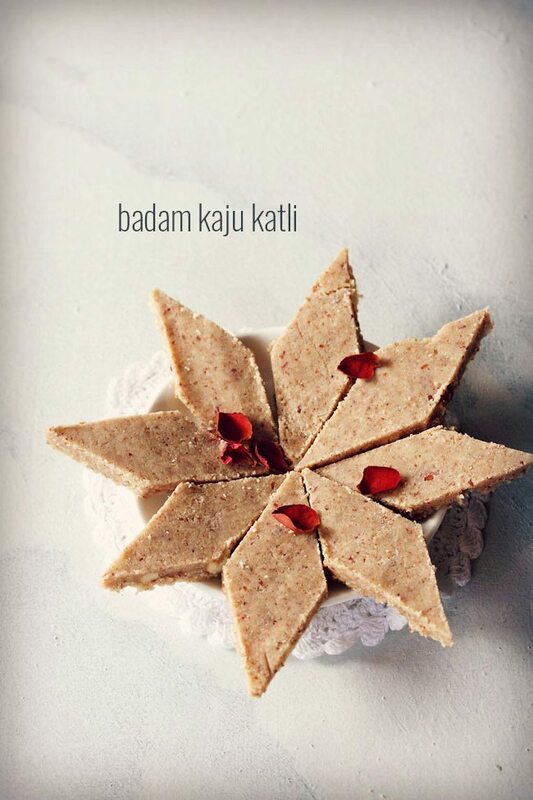 badam kheer recipe with step by step photos – badam kheer or badam payasam is a delicious creamy kheer made with blanched almond paste, milk and saffron. 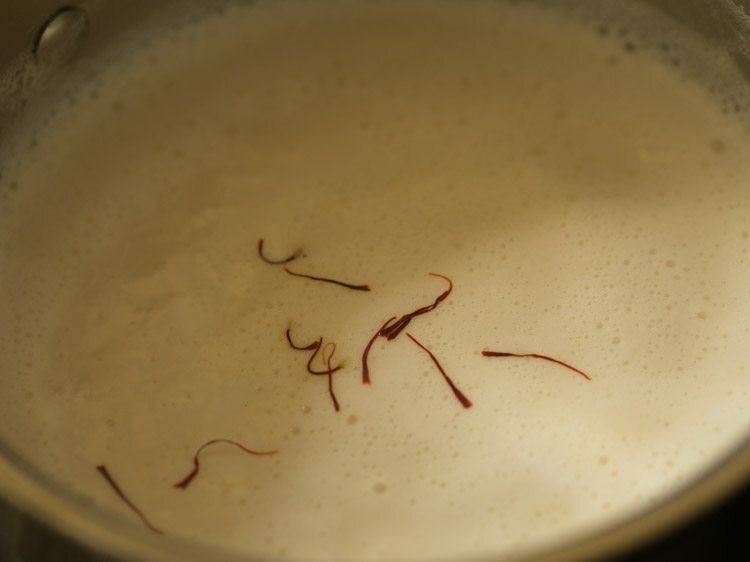 kheer and payasam recipes are easy to prepare during festive occasions and do not take a lot of time. most of the times for religious or festive occasions, i prepare sooji halwa or rice kheer or vermicelli kheer. 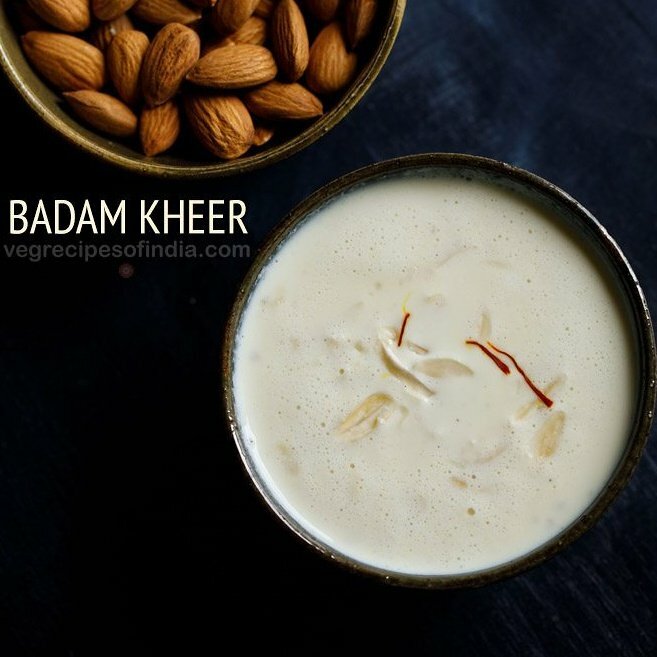 badam kheer recipe looks similar to badam milk, but the taste as well as the consistency is different. 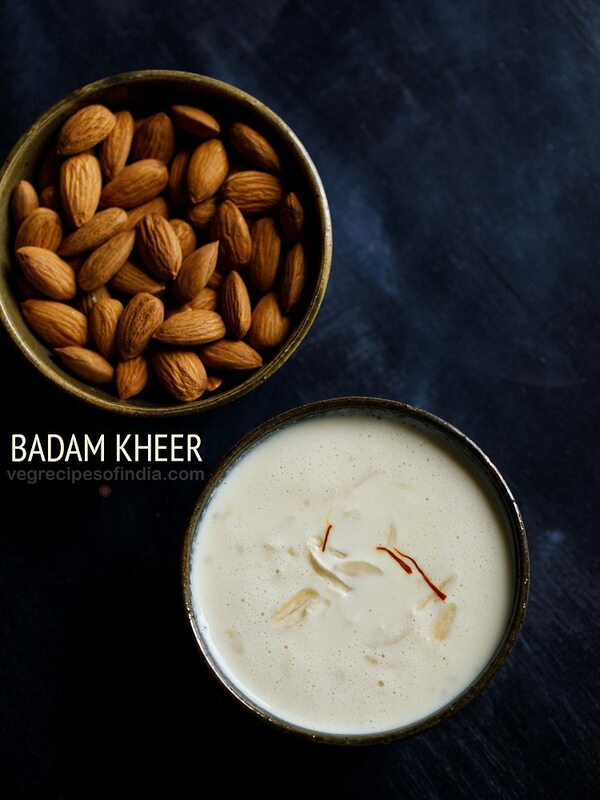 badam kheer is creamier and thicker as compared to badam milk which is a light refreshing beverage drink. 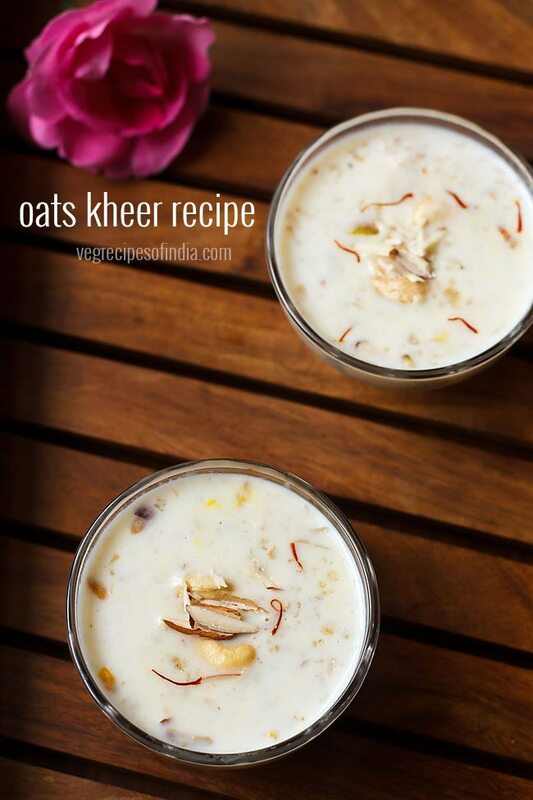 badam kheer can be served warm or chilled. 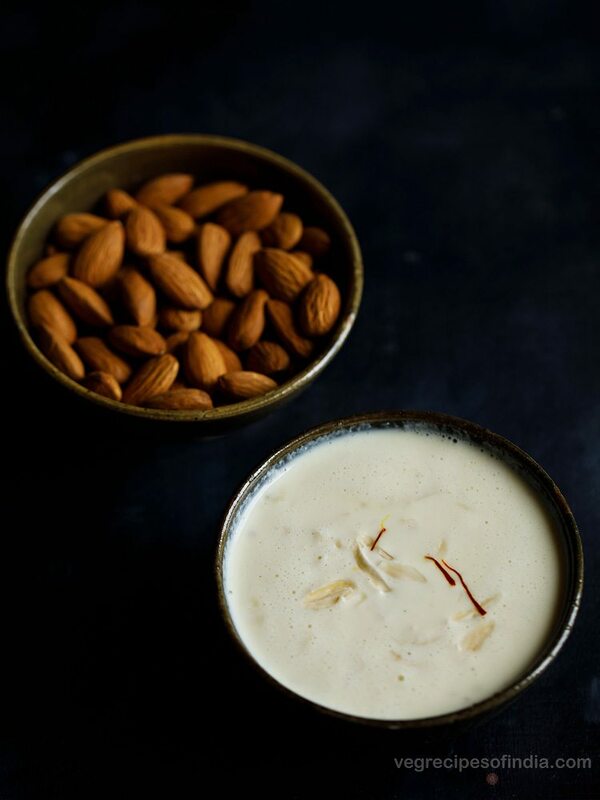 serve almond kheer as a dessert after meals. 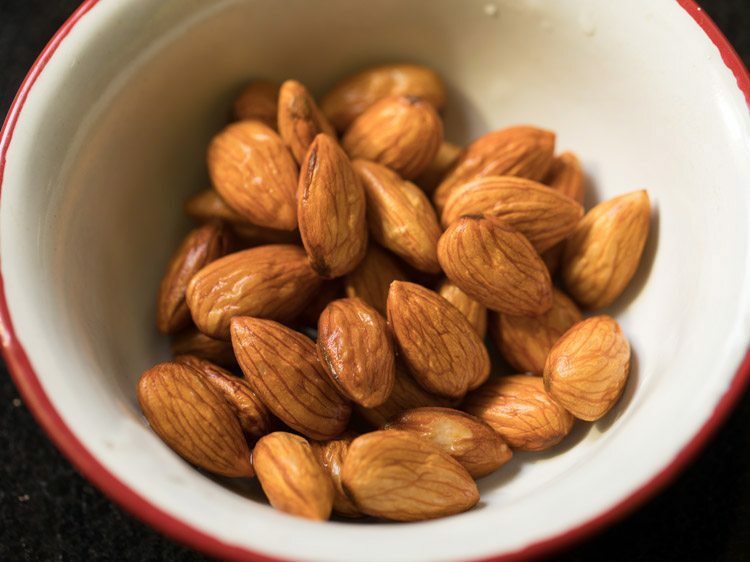 rinse ¼ cup almonds (about 35 almonds) and add them in a bowl. then pour ⅓ cup hot boiling water. cover and keep aside for 30 to 40 minutes. then drain all the water. peel the almonds. you just need to press the skin and it comes out easily. 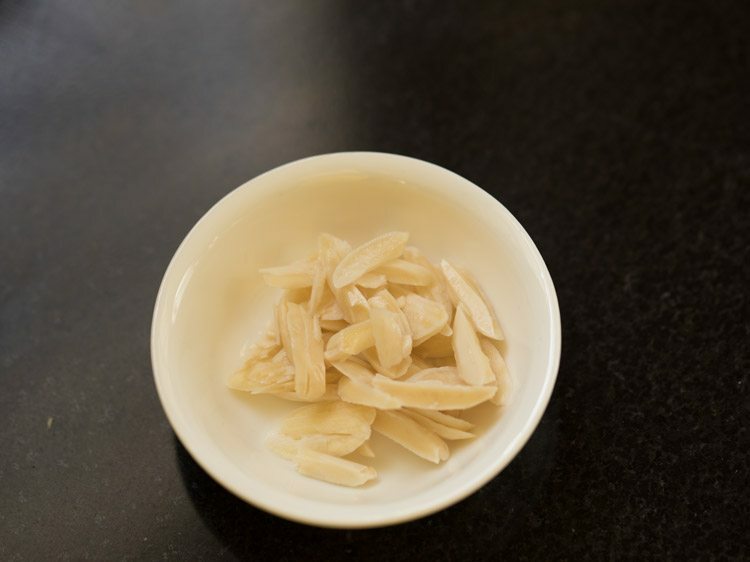 take 3 to 4 of blanched almonds and slice them thinly. add the remaining almonds in a grinder jar. next add 5 tablespoons sugar or add as required, seeds from 4 green cardamoms. 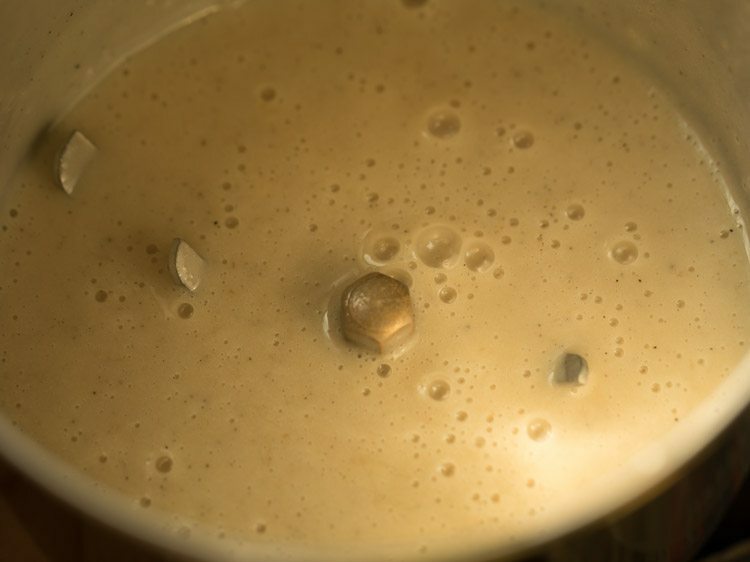 add ¼ to ⅓ cup milk. 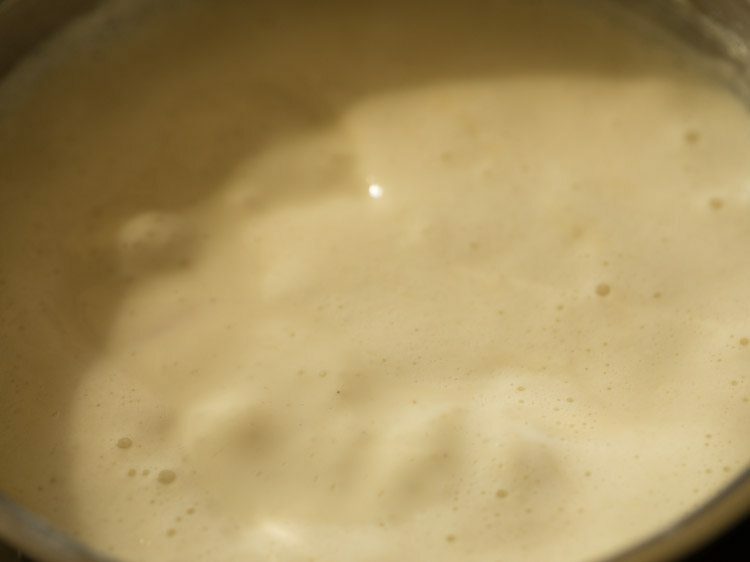 milk can be chilled or at room temperature. grind till smooth. the almonds should be ground very well to a smooth consistency. if there are coarse particles or chunks, then it can be irritating to the throat. take 2.5 cups milk in a pan. 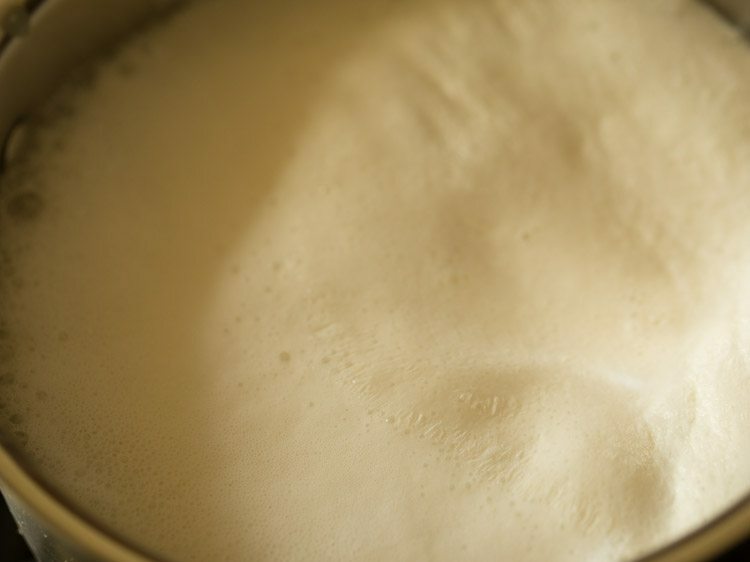 make sure that the pan is large enough so that the milk does not spill out while boiling. 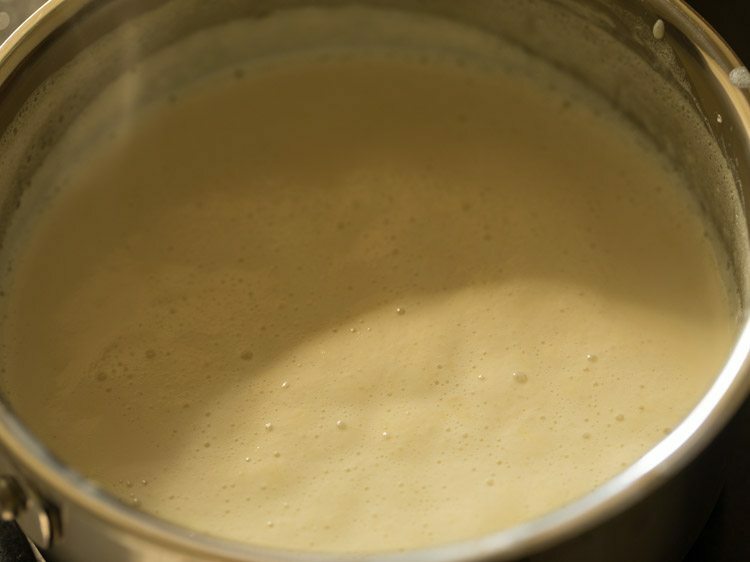 keep the pan on a low flame and begin to heat badam milk till it comes to a boil. 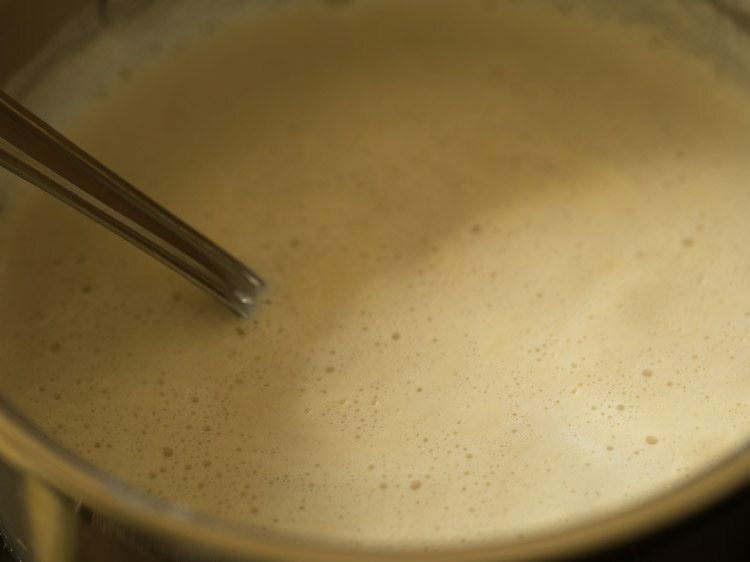 stir at intervals so that the milk does not scorch from the bottom. add 10 to 12 saffron strands and stir. simmer on low flame for 3 to 4 minutes. do stir at intervals. then add the almond paste. mix very well with a spoon. 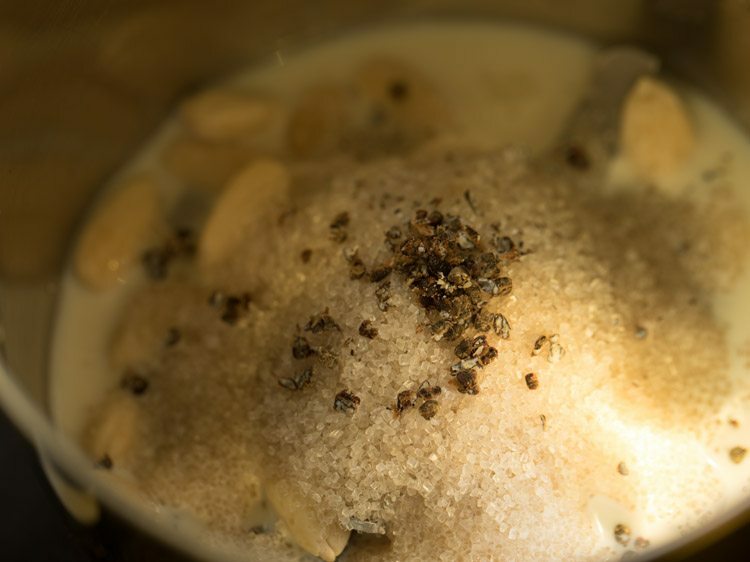 let the entire badam ki kheer come to a boil. then switch off the flame. 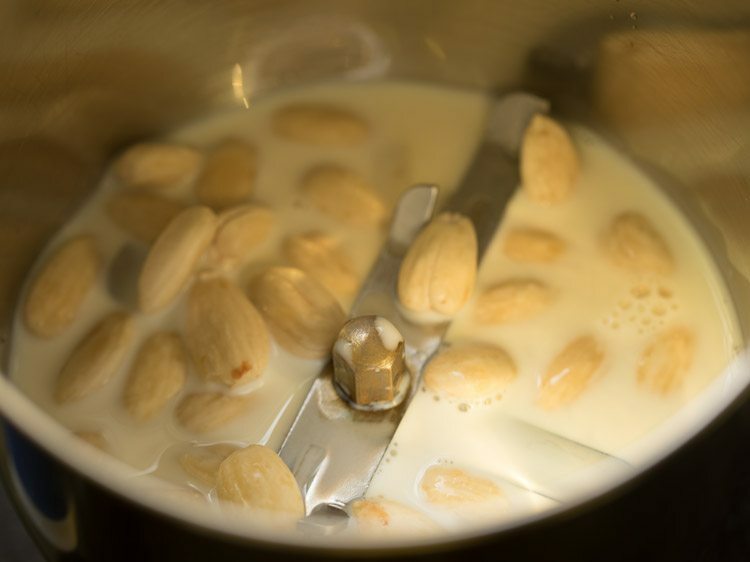 scrape the evaporated and dried milk at the sides of the pan and add them in the badam kheer. 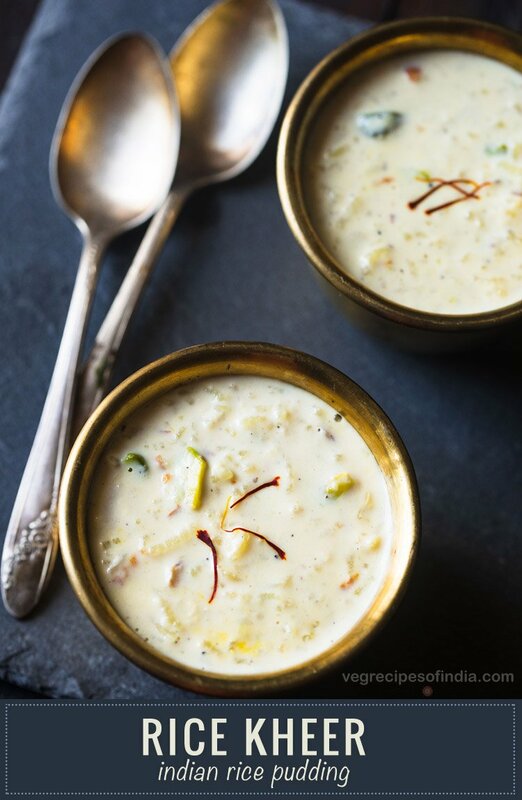 you can serve badam kheer hot, warm or chilled. 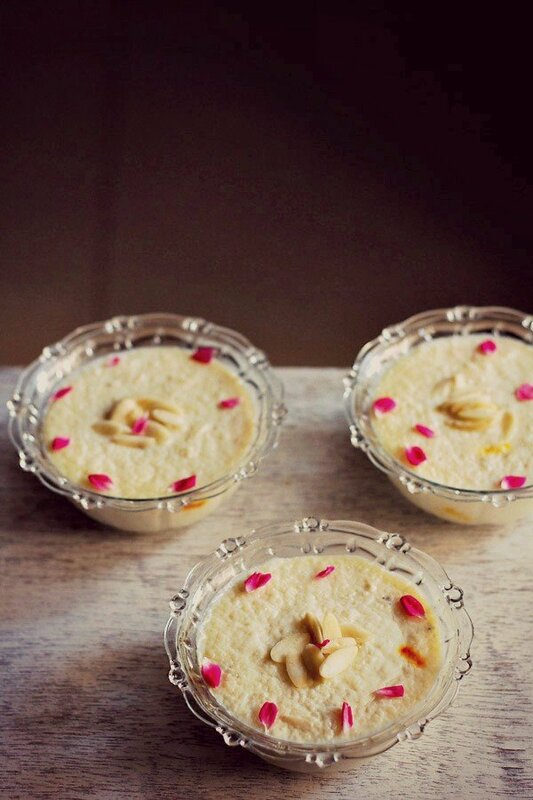 while serving garnish badam ki kheer with the sliced almonds and a few strands of saffron. 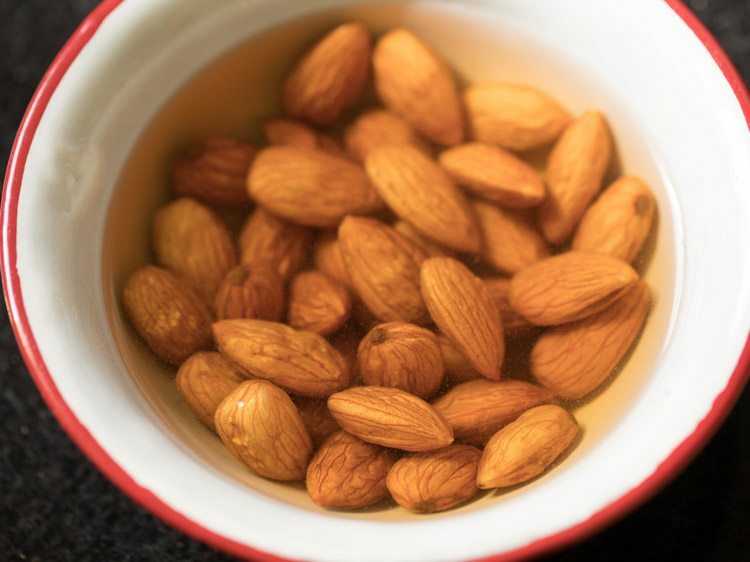 1. rinse ¼ cup almonds (about 35 almonds) and add them in a bowl. then pour ⅓ cup hot boiling water. cover and keep aside for 30 to 40 minutes. 3. peel the almonds. you just need to press the skin and it comes out easily. 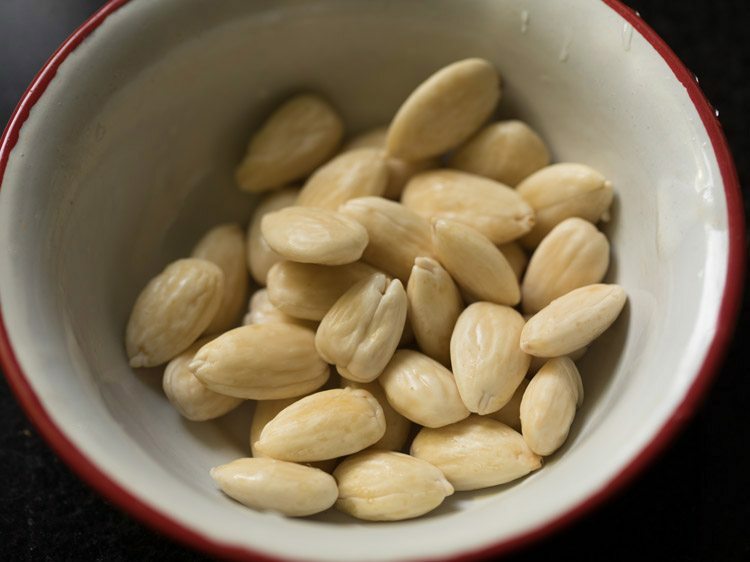 4. take 3 to 4 of blanched almonds and slice them thinly. 5. add the remaining almonds in a grinder jar. next add ¼ to ⅓ cup milk. milk can be chilled or at room temperature. 6. next add 5 tablespoons sugar or add as required. for a less sweet taste you can add 4 tablespoons sugar. 7. next add seeds from 4 green cardamoms. 8. grind till smooth. the almonds should be ground very well to a smooth consistency. if there are coarse particles or chunks, then it can be irritating to the throat. 9. take 2.5 cups milk in a pan. 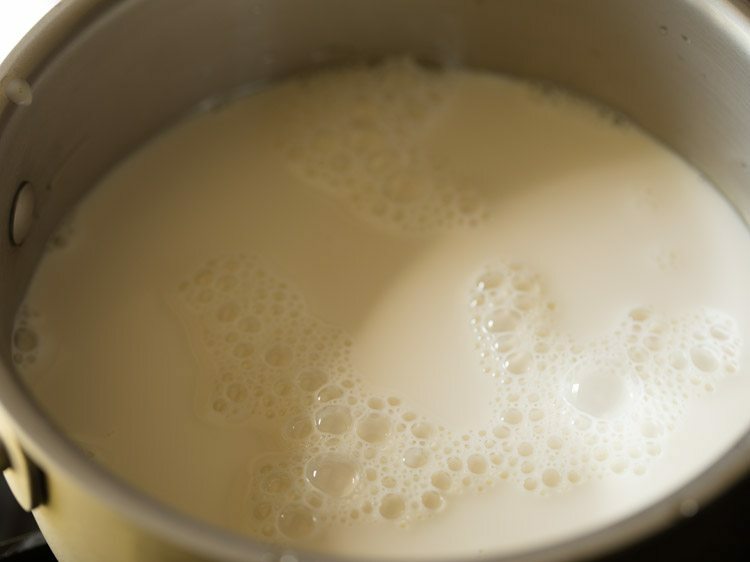 make sure that the pan is large enough so that the milk does not spill out while boiling. 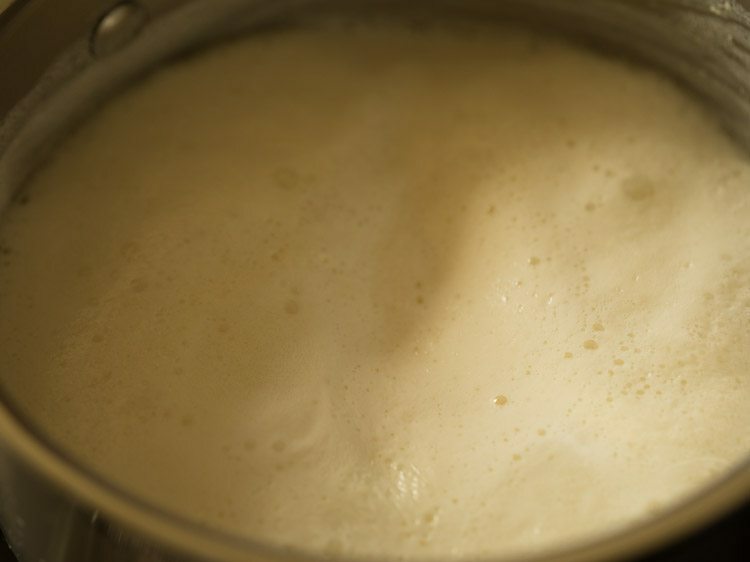 10. keep the pan on a low flame and begin to heat milk till it comes to a boil. 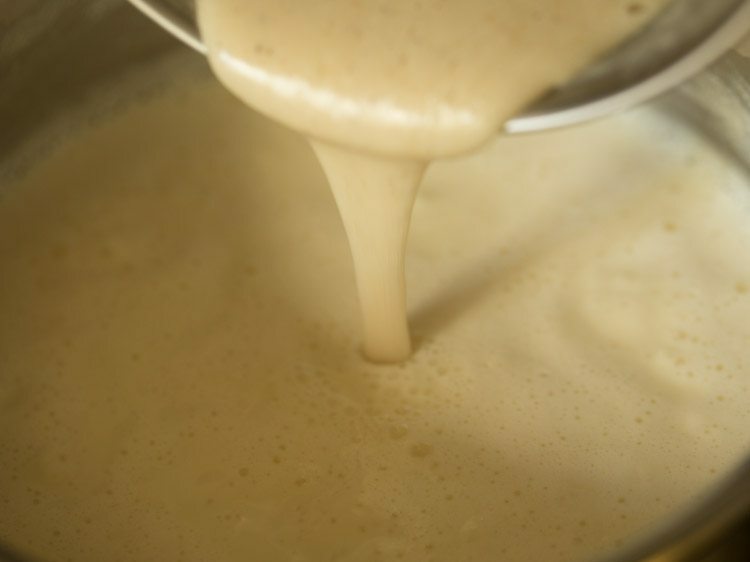 stir at intervals so that the milk does not scorch from the bottom. 11. add 10 to 12 saffron strands. 12. simmer on low flame for 3 to 4 minutes. do stir at intervals. 13. then add the almond paste. 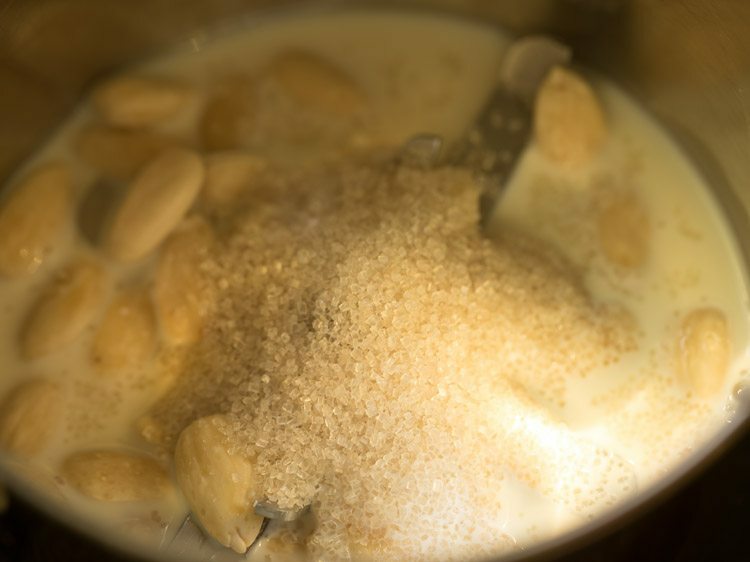 15. let the entire almond kheer come to a boil. 16. then switch off the flame. 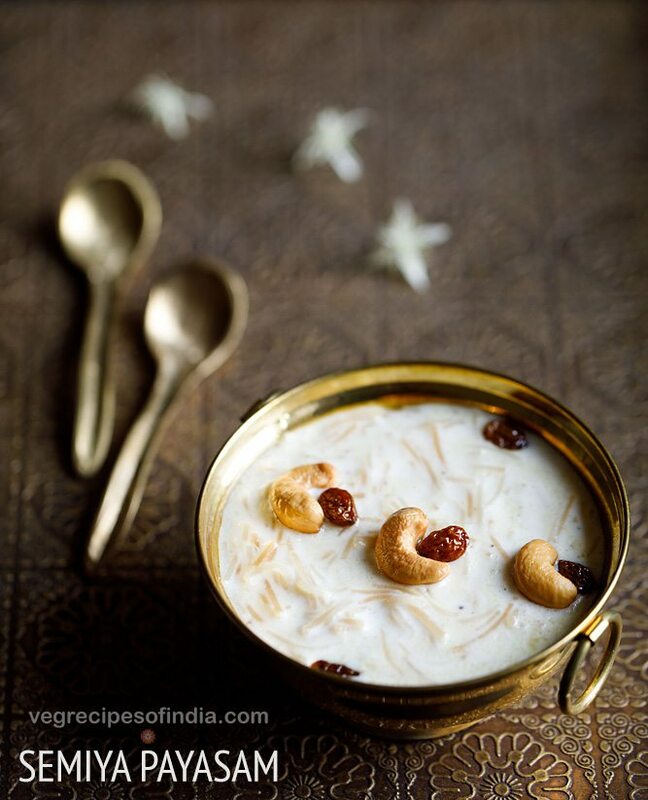 scrape the evaporated and dried milk at the sides of the pan and add them in the badam kheer. thanks for sharing the feedback priyanka and welcome. Hi Dasanna have you used normal milk or full fat milk? priyanka, i have used full fat milk. patricia, only you can unsubscribe from your browser settings. we cannot do this from our end.